Although Seashore Paspalum (Paspalum vaginatum) is the newest "buzz" word in the turf industry today, Paspalum has been around for many years. The cultivar Adalayd was discovered by Hugh Whiting in the early 1970's and patented soon after. This is the cultivar that was planted at Alden Pines Country Club in 1980. 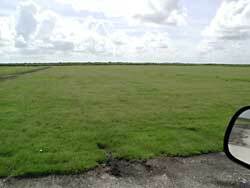 From this cultivar, many ecotypes of Paspalum were propagated with influence through maintenance practices. As new ecotypes where bred and evolved through sexual reproduction, Alden Pines became a 55 acre, outdoor breeding lab for Paspalum, while at the same time getting 40,000 rounds of golf per year. Alden Pines is located on an island off the west coast of Florida, just North of Naples. I became a co-owner and the Superintendent of Alden Pines County Club in 1993 after graduating from Lake City Community College. Alden Pines was planted in Seashore Paspalum because after construction of the golf course, no supply of fresh water could be found. The cost of an R.O. plant was way beyond budget and the best water quality available was brackish at about 5,000 PPM, which is still being used today in conjunction with other sources of "salty water". That first summer I was at Alden Pines, a tropical storm swept north through the Gulf of Mexico and left my front nine fairways flooded with seawater. I was fearful, to say the least, of what may happen to my golf course during the next few days. Knowing very little about Seashore Paspalum, I was amazed at what actually did happen. Within two days after the salt water receded, any weed species that were present were showing severe signs of decline from the effects of the salt water. But the Paspalum seemed to green-up and actually show signs of vigor. On that day in June of 1993, I had the realization that I was dealing with a very unique turfgrass. I have put Paspalum through many different uses and environmental scenarios since then. From fresh water (less than 500 PPM) to brine water (45,000 PPM) and everything in between. Summer temperatures near 100 degrees F. with a humidity of 95% and no rainfall at all for several months, to winter weather with five consecutive mornings of frost, 30 degrees F. air temperatures and 42 degrees F., soil temperatures. In the summer of 1995 we had monsoon rains totaling 14 inches in one week that left the Paspalum under one foot of water for 5 days. Yet after all of these adverse weather and environmental conditions, the Paspalum still held up strong. Seashore Paspalum has taught me a lot in the last 12 years and I'm a firm believer that there are many uses for this turfgrass. The greatest thing about having the opportunity to work with all of the Paspalums at Alden Pines is that I am able to evaluate the turf under actual golf course use conditions. I have learned from many mistakes that I have made. I know most of the pros and cons of Paspalum, and have had the opportunity to devise and test many different maintenance programs that Paspalum may need for all of its potential different applications. The turf industry has gotten several of its best paspalums from this 25 year old golf course. SeaWay®, SeaGreen®, SeaDwarf and Sea Isle 2000 all originated from Alden Pines Country Club. There are many others in the industry who have worked very hard to develop and promote Seashore paspalum and they have done an excellent job! If you are interested in Paspalum and want to find out as much as you can about this unique and newest turfgrass, please send me an email, as I'm sure that I can be of great help to you.